Tear packages of artichokes open and keep sip-top sealed. Microwave according to package directions for 6 minutes. Remove from the microwave and let cool until they are cool enough to handle. Remove leaves from artichokes (save them to eat!). Scoop out fuzzy chokes and discard. Cut hearts into quarters. 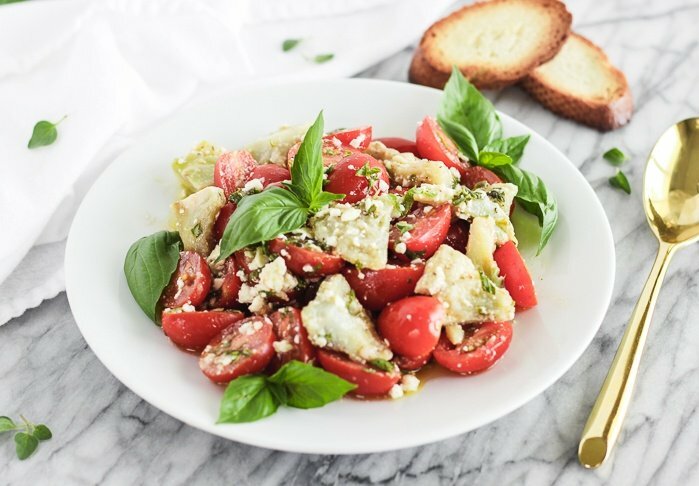 Place artichoke hearts in a bowl with tomatoes. Set aside. In a small bowl or glass measuring cup, use a fork to mash garlic clove with salt until a paste is formed. Whisk in lemon juice, vinegar and olive oil. Finely chop basil and oregano. Add to red wine vinaigrette with pepper. Pour over tomatoes and artichokes and stir to coat. Gently stir in feta. Place salad in the refrigerator to marinate 2-3 hours before serving.